If you are a foreign author interested in the Amsterdam Residency Programme please read the conditions carefully. Please also note that applications have to be made well in advance. 2019 has been fully booked already; in 2020, Anglophone authors will be given priority due to our large-scale campaign in the English language area during this year. If you think you meet the programme’s requirements, write us an e-mail with a short biography and explain us what project you would like to work on while in Amsterdam. We would also like to know if there is a specific reason why you want to come to the Netherlands. And don’t forget to mention the Dutch publishing house that has published your work. If we think you are a suitable candidate we will respond to your e-mail and encourage you to apply formally. This means that participation in the programme is only at the invitation of the board of the foundation. If you do not meet the basic requirements to apply, you will not receive a response or rejection letter. Due to the continuous and large-scale interest in the residency we unfortunately can not answer every email. We apologize in advance. If you represent a (foreign) organisation (e.g. publishing house or cultural institute) it is also possible to recommend an author to our programme. Please write us an e-mail explaining why you think the author is a suitable candidate and we will respond in due time. Please note that authors that have not found a Dutch publisher yet, do not meet our requirements. On the YouTube-channel of the Nederlands Letterenfonds (Dutch Foundation for Literature) you will find many short videos with previous writers in residence. Only authors whose work has been translated into Dutch can apply. Both novelists, poets, children book writers and essayists (of relevance to the current political debate in the Netherlands and beyond) are, in principle, eligible for the programme. The final selection is influenced by the ways in which the writer-in-residence might play his part in Amsterdam or the Netherlands. Most guest writers come not only to write or to do research, but also to promote the translation of one of their books or to attend a literary festival. Even though the programme is mainly intended for European authors, this does not necessarily exclude authors from outside Europe. And finally it is good to know that most writers participating in the programme have a very specific reason for coming to Amsterdam. The residency period is expected to last around six weeks. The guest writers use their time in Amsterdam for their own work and research, but they are also involved in the city’s literary and cultural life. All candidates may be asked to give public performances, guest lectures or readings for students and to write articles for newspapers or magazines. The writers’ residence is located in the heart of Amsterdam. The square on which the apartment looks out is called 'het Spui'. The apartment is decorated with Dutch Design. Many young Dutch designers and interior decorators have supported the residence project with furniture, lamps and decorative elements. The apartment is also decorated with paintings by the late, multi-talented Dutch author Henk van Woerden. 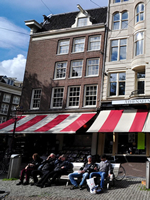 Athenaeum Booksellers will see to a well-stocked library of Dutch literature in translation, as well as foreign studies dealing with Dutch and European history and contemporary issues. Design for the apartment has been provided by Droog Design, Eikelenboom, Moooi, Linteloo, Pol’s Potten, Scorlewald and Koninklijke Tichelaar Makkum, and by the designers Jacob de Baan, Hil Driessen, Trine Kornum, Sara Kramer, Reny van der Kamp and Ineke van der Struijs. Parallel to the upcoming campaign around Dutch literature of the Dutch Foundation for Literature in the UK, New Dutch Writing, the Amsterdam Residency will host several authors from the UK and USA in 2020. The residency was closed for maintenance in March. Aura Xilonen on the diary of Anne Frank (Spanish spoken). In 2016, leading up to the Frankfurter Buchmesse where the Netherlands and Flanders were guest of honour, the Dutch Foundation invited German writers-in-residence only. Recommendations on Dutch Literature by the German writers in residence. WiR Nir Baram on his novel The World is a Rumor (Wereldschaduw in Dutch translation by Sylvie Hoyinck for Bezige Bij Publishers). Ece Temelkuran on her novel Banana Sounds (Het geluid van bananen in Dutch translation by Margreet Dorleijn for Van Gennep Publishers). Since 2009 the Geldersekade apartment is no longer a location we can use all year round. Only on special request and in consultation with the University of Amsterdam a writer can make use of it.